If your idea of a fine time at the movies is watching Denzel Washington be a badass and murder people in grisly fashion for two hours, then The Equalizer is right up your alley. There’s not much to the plot of this loose remake of the 1980s TV show of the same name; Denzel plays a man with a mysterious past who works at a large Home Depot-esque hardware store. He sees injustice transpiring against his pals, and he fixes it in a violent fashion. The movie is two storylines that don’t converge until the final act, namely the Russian crime syndicate trying to ascertain who this vengeful badass just might be, and Denzel doing his episodic vigilante good deeds. The climactic act is a drawn out showdown where Denzel uses every part of the hardware store to deadly results. There’s definitely a pleasure in watching Denzel dispatch tough-talking baddies, and that’s what the film delivers, no more, no less. The confrontations are generally well written and ratchet tension nicely, especially when Denzel has some chilly conversations with his soon-to-be-victims before they inevitably make their bad decisions. The tense sit-downs were more entertaining for me than the bloody violence. Director Antoine Fuqua (Training Day, Olympus Has Fallen) goes about his business in a more than competent manner; the technical qualities are above average, though the film has moments where it seems too infatuated with its slick sense of style (slow-mo rain gun battles?). With a stream of bad guys to be toppled at a steady interval, The Equalizer can start to feel like an assembly line of cocksure carnage, a ready-made vehicle for audience blood lust. 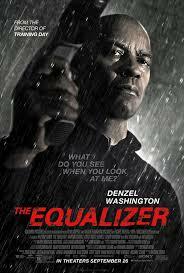 Still, watching Denzel be a badass and kill a whole lot of bad people is enough for a movie. Just don’t expect much more than that scenario and you may be satisfied if you’re not too squeamish when it comes to bloodshed. Posted on October 14, 2014, in 2014 Movies and tagged action, antoine fuqua, chloe grace moritz, denzel washington, drama, gory, mafia, thriller, TV show. Bookmark the permalink. Leave a comment.